Construction and testing of composite parts: Fer/FNR/Hyd1, HydEFG, and Hydrogen Gas Producing Gene Cluster. Improvement of previous part: Ferredoxin/Ferredoxin NADP Reductase (FDX/FNR). Measuring hydrogen gas production using a Clark electrode. Furthering those results with a gas measuring apparatus. Proving the presence of hydrogen gas in our gas mixture with a pop test. 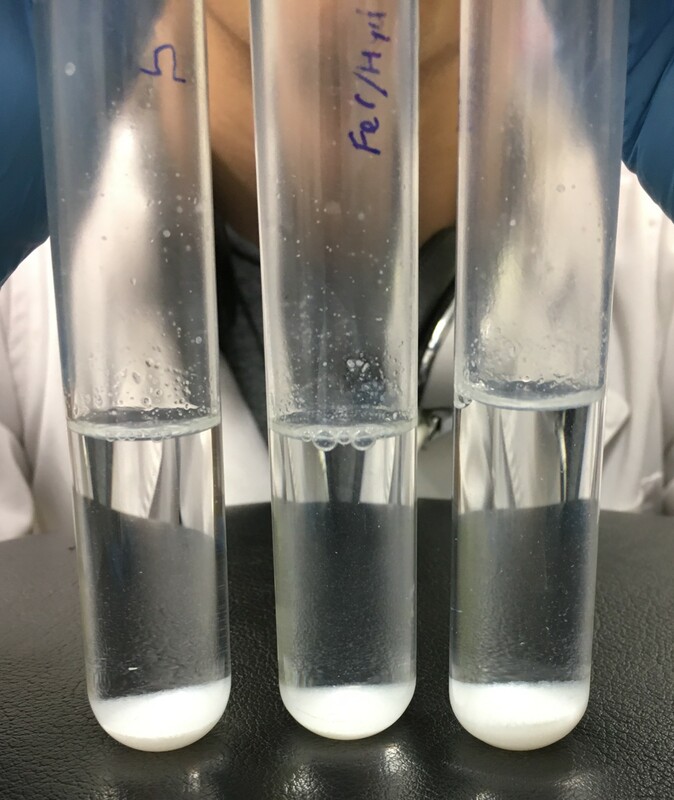 To quantify the hydrogen gas produced by the Hydrogen Gas Producing Gene Cluster (HGPGC) cells, the dissolved hydrogen was measured with a Clark electrode. Clark electrodes are well-known for measuring concentrations of dissolved oxygen in a water solution (Mišlov et al. 2015). However, a Clark electrode can also measure dissolved hydrogen gas by changing the polarity of the electrodes, to opposite, when compared to measuring oxygen. The voltage is set to 600 mV which enables oxidation of hydrogen at the working electrode (Mišlov et al. 2015). Each time a hydrogen molecule is oxidized at the working electrode, electrons are generated. The current generated is proportional to the concentration of dissolved hydrogen (Mišlov et al. 2015). The free hydrogen ions will react with the chlorine ions. Figure 1. A Clark electrode and chart recorder used to measure the dissolved hydrogen gas in our HGPGC culture. The current is converted to a voltage that is proportional to the line 'written out' by the chart recorder. The four samples were grown to the same concentration, OD600 0.6, and induced with 1 mM IPTG. When they were added to an electrode, the cultures were passaged to the same concentration, OD600 0.2, and re-induced with 1 mM IPTG. Full details of the method can be found here. In Figure 2A, the first biological replicate of the samples was measured for hydrogen gas production. In the graph, all of the samples produced varying levels of hydrogen gas. However, the induced and un-induced HGPGC produced more hydrogen gas than the negative control over time. Even, Fer/Hyd produced more hydrogen gas than the negative control. Figure 2A. The overall hydrogen gas produced over time for the four different samples. The HGPGC culture went 'off scale,' so the true peak value for the green coloured line is projected to be much higher than shown. The exponential growth of hydrogen gas production and the decay of hydrogen gas production was determined from the four samples (Figure 2B and C). The induced HCPGC produced hydrogen gas at a quicker rate than the other samples. Figure 2B. The exponential growth of hydrogen gas production in the four samples. The HGPGC culture went 'off scale,' so the true peak value for the green coloured line is projected to be much higher than shown. Figure 2C. The decay of hydrogen gas production in the four samples. The HGPGC culture went 'off scale,' so the true peak value for the green coloured line is projected to be much higher than shown. 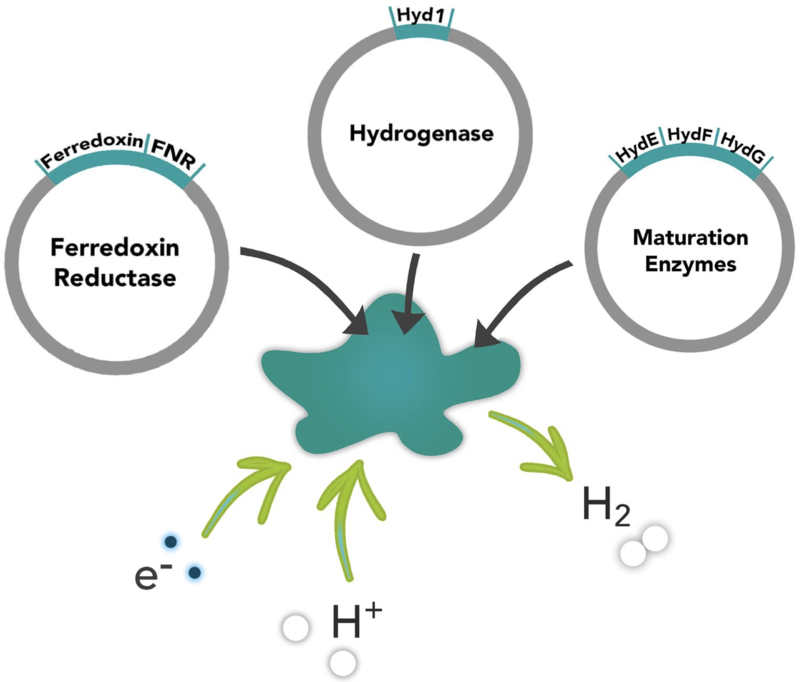 In Figure 2D, the second biological replicate of the samples was measured for hydrogen gas production. This replicate used the same cultures and was prepared the same way as done in Figures 2A-C. Similarly, the induced HGPGC culture produced the most hydrogen gas over time. The culture does not start at 0 mM H2 because it is a mature culture, so hydrogen gas was already being produced. The green line on the left graph represents the induced HGPGC, where the amount of hydrogen gas produced actually GOES ABOVE 0.8 mM, so the culture was super-saturated with the hydrogen gas that it produced. There was actually such a difference in hydrogen gas production between the cultures that the y-axis is on 2 different scales for visibility. 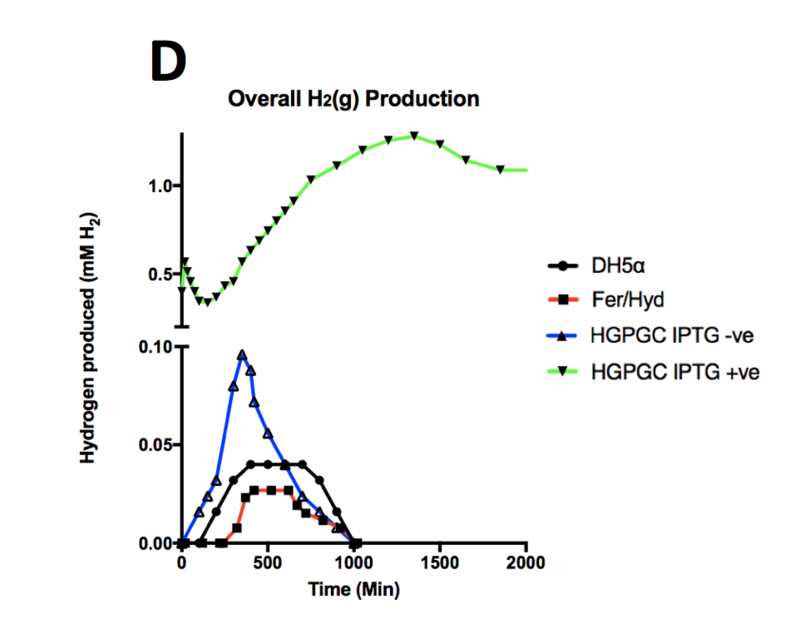 This indicates that our HGPGC plasmid results in successful production of hydrogen gas way above the uninduced HGPGC, the induced Fer/Hyd, and induced untransformed DH5α. In fact, the induced HGPGC culture produced 32x more than the untransformed culture and 13x more than the uninduced HGPGC cluster. Figure 2D. The overall hydrogen gas produced over time for the four different samples. 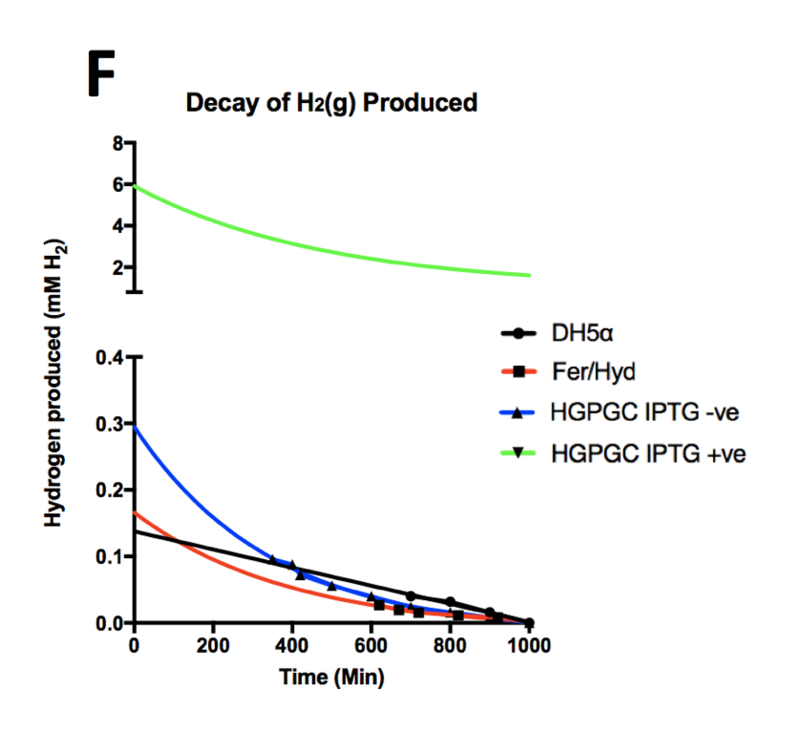 The induced HGPGC culture produced the most hydrogen gas over time. 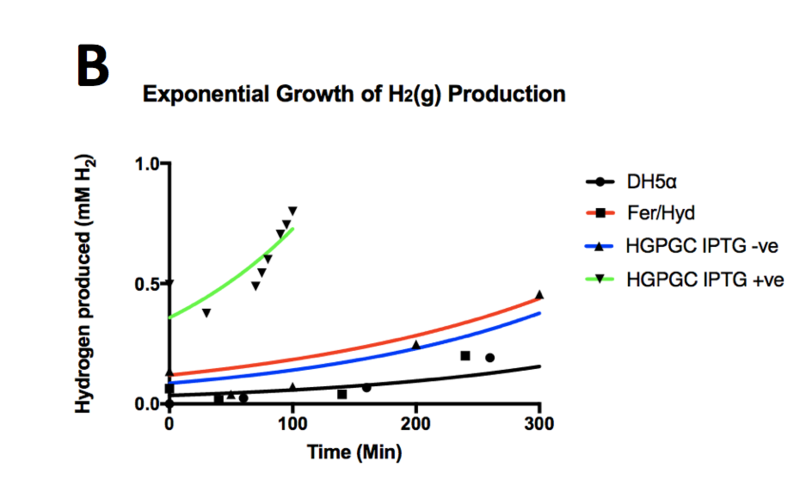 The exponential growth of hydrogen gas production and the decay of hydrogen gas production was determined from the four samples (Figure 2E and F). The induced HCPGC produced hydrogen gas at a quicker rate and decayed slower than the other samples. In fact, the sample did not reach 0 mM H2 in the time period. The exponential growth of hydrogen gas for the cultures was calculated to to see how fast the hydrogen gas was being produced. The maximum rate of the induced HGPGC culture was 0.73 mM H2/L/min and the maximum rate of the uninduced HGPGC culture was only 0.1 mM H2/L/min. 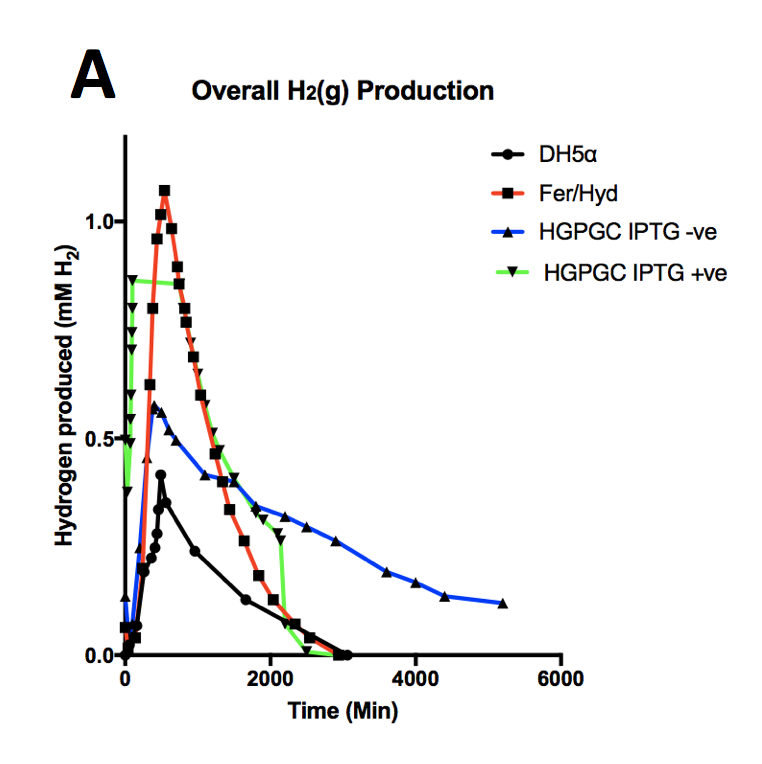 Further showing that our induced HGPGC culture produces more hydrogen gas and produces it at a faster rate than the uninduced HGPGC culture. Figure 2E. The exponential growth of hydrogen gas production in the four samples. The HGPGC culture produced hydrogen gas at the quickest rate. Figure 2F. The decay of hydrogen gas production in the four samples. The HGPGC culture decayed at the slowest rate, it did not reach 0 mM H2 in the given period. In the Clark electrode, hydrogen gas is consumed to produce a current and voltage for the reporter to read. To determine the rate of consumption, a pure hydrogenated gas solution was added to an electrode, as shown in Figure 3. 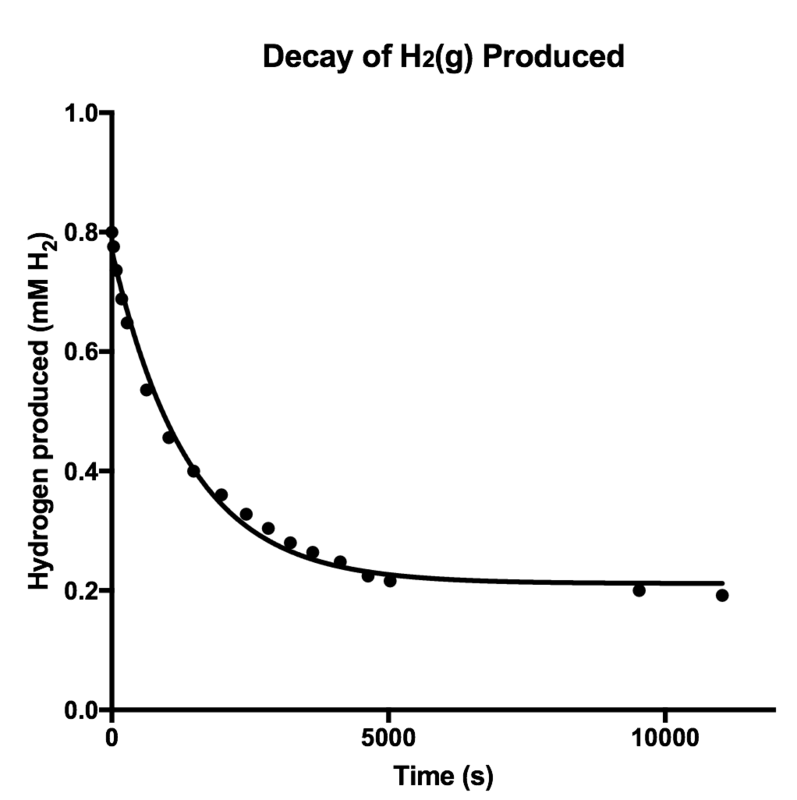 From the graph, we can see that the hydrogen gas in a pure hydrogenated solution (at 0.8 mM) is reacting with the working electrode, since it is being consumed and decreasing in concentration over time. Figure 3. The decay of pure hydrogenated gas in solution, at 0.8 mM, in the electrode. From this data, we can be confident that our induced HGPGC culture is producing hydrogen gas in the E. coli since there is more hydrogen gas produced when compared to the negative control. Even when compared to Fer/Hyd, more gas is produced and is produced at a higher rate, demonstrating that the maturation enzymes (HydEFG) are helping to produce this gas. However, the uninduced HGPGC sample is producing hydrogen gas at a similar rate to the induced sample, which indicates a ‘leaky’ promoter in the operon. 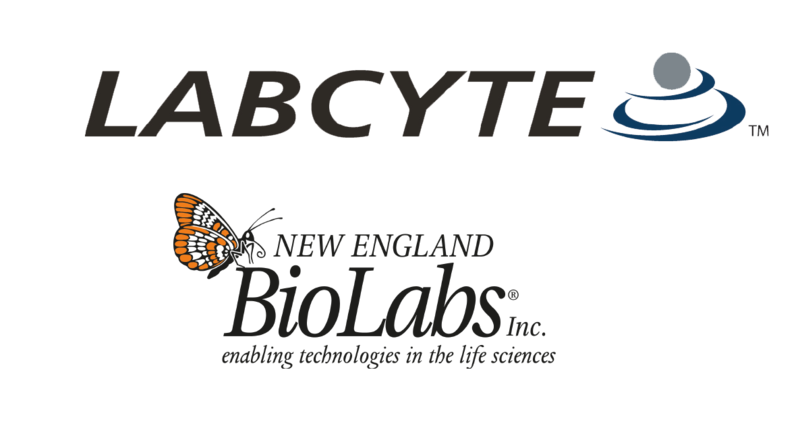 From this data, we are confident that when our HGPGC plasmid is transformed in E. coli hydrogen gas will be produced at a rate of 2.37 mL H2/hr/L for 2 mL induced HGPGC cells. See the modelling page for more details. 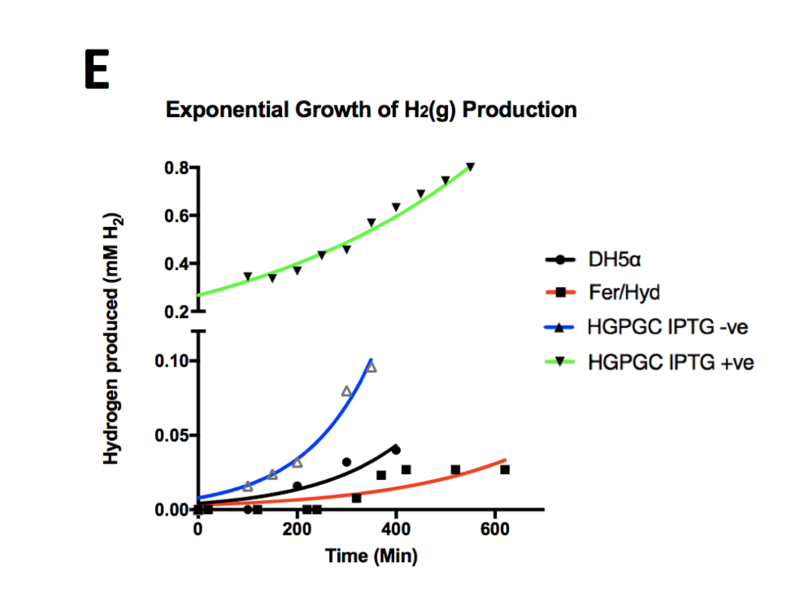 These experiments indicate that not only does our composite part have the capability of producing hydrogen but, by comparison with Fer/Hyd1 alone, we can see that the maturation enzymes included in HGPGC cells are contributing by increasing the rate, volume and longevity of hydrogen production. HGPGC also exceeds any hydrogen production from the E. coli endogenous hydrogenase. To further demonstrate this work, we have also measured hydrogen gas production with a gas measuring apparatus. Figure 4. Overview of the gas measuring apparatus. 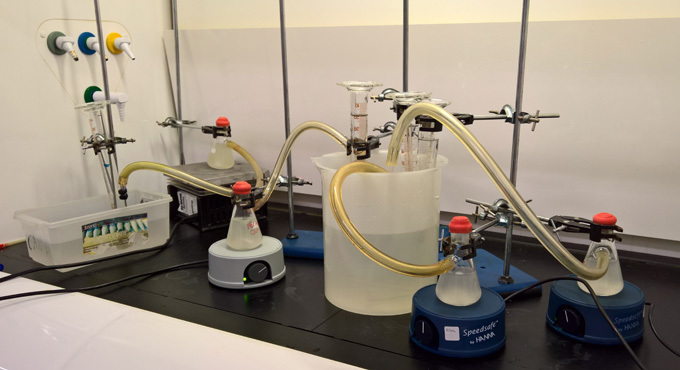 Each measuring cylinder is connected to a culture flask via tubing. Total gas was collected and measured using an apparatus involving upturned measuring cylinders partially submerged in water and linked to cultures via tubing. 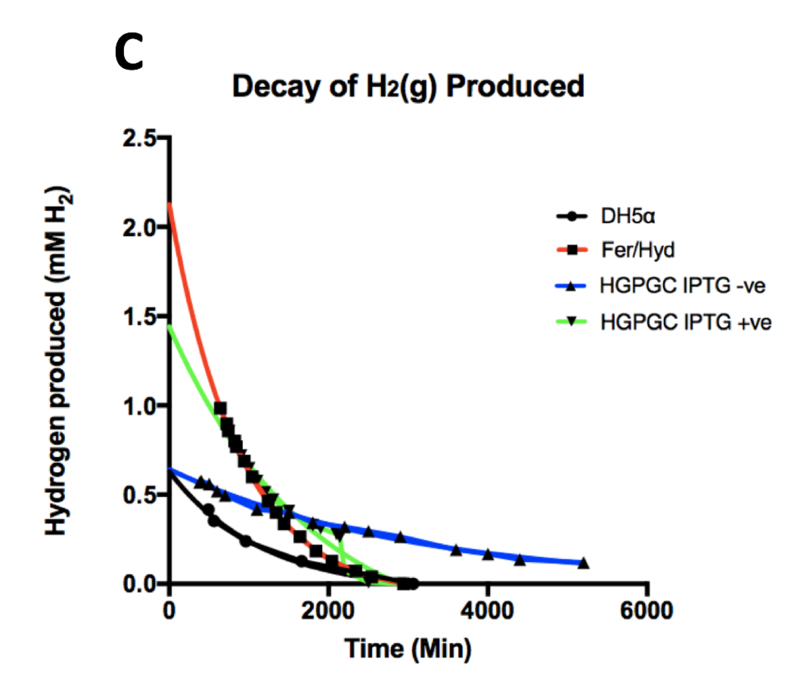 In this way we could measure the total volume of gas produced over time for three induced cultures: HGPGC cells, Fer/Hyd cells and original non-transformed DH5α. All cylinders were equalised to a starting gas volume of 15 mL. Full details of the method can be found here. Figure 5. The overall setup of the gas measuring apparatus. The cylinder is filled with water, up until the 15 mL mark. A glass rod connects the cylinder to the Büchner flask with 80 mL mature culture in M9 media with an approximate OD600 0.2, supplemented with 20 mM glucose and 1 mM IPTG. The gas can be removed with a syringe. Figure 6. Barium hydroxide makes CO2 precipitate out of gas into barium carbonate, which can be weighed to calculate how much CO2 gas was produced. The flask was continuously stirred, and volume readings for each cylinder were taken at regular intervals. 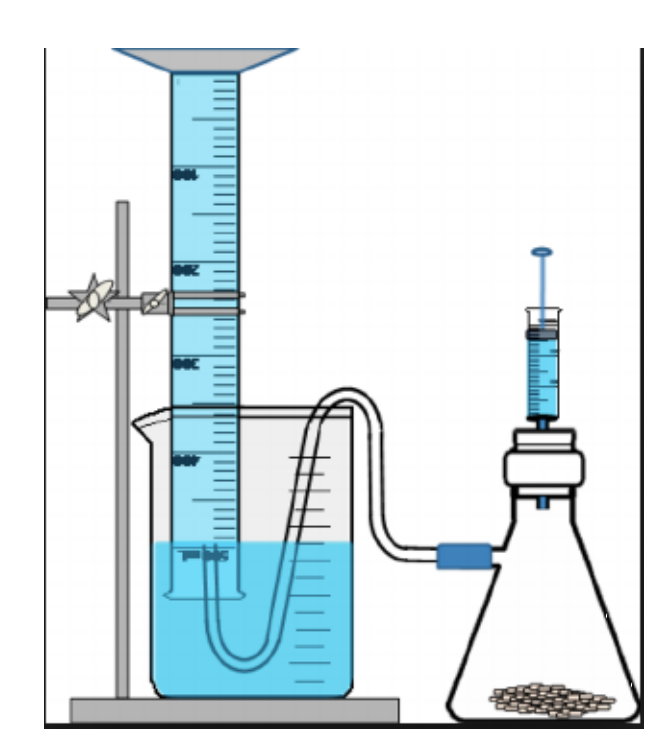 In this apparatus, any gas produced by the cultures displaced water in the cylinder. To test for the percent hydrogen gas in each headspace, a 20 mL gas sample was taken from each culture using a syringe and weighed (Figure 7). 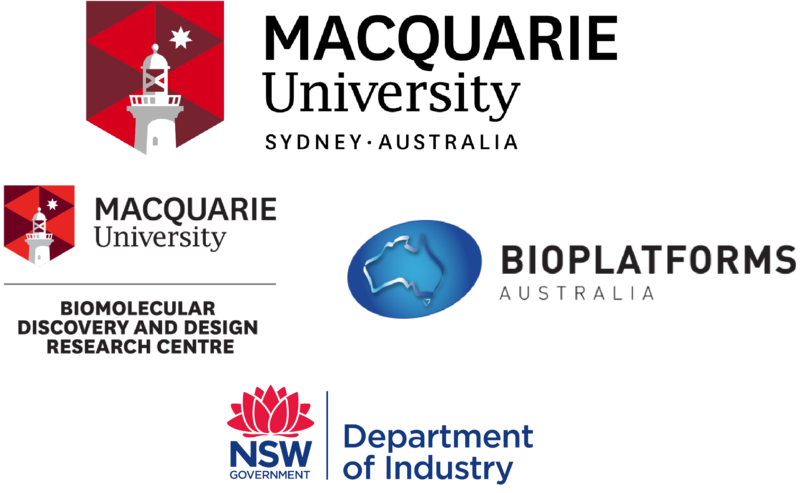 The modelling results of the apparatus can be found here. Figure 7. Flow diagram of the gas measuring apparatus work flow. In the first cylinder, the headspace (the air above the water in the measuring cylinder) contains air, which has a ratio of 80:20 of N2 to O2. Since it is an anaerobic environment, the oxygen is consumed by the culture and CO2 and H2 are produced. The N2 gas is still present. After a period of time, the water levels in the measuring cylinder fall, since there is continuous CO2 and H2 produced. To determine the amount of H2 produced, the CO2 is precipitated with barium hydroxide, to form barium carbonate. We found that there was 20 mL of CO2 present in the cylinder. By weighing the remaining gas, we determined the amount of N2 to H2. There was 92 percent N2 and 7 percent H2 produced. After the CO2 free gas was extracted, the remaining gas was weighed. It was compared with the weight of pure H2 and pure air, and the weight of the gas was less than air but more than H2. This indicated that there was a mixture of N2 and H2 present. We estimated there was 88 mL of air present in the start of the apparatus (headspaces and tube). Since we can assume that the O2 was consumed, since it is an anaerobic environment, the ratio is of N2 and H2 should be 80 percent N2 and 20 percent H2. After weighing the gas in the tube, it was determined that 92 percent N2 and 7 percent O2 was present, which indicates that air was leaking in. However, this shows that the E. coli transformed with the HGPGC plasmid is producing hydrogen gas at a rate of 7 mL/H2/hr/L for 80 mL induced cells. In future experiments, a more elaborate set up that is completely gas tight or a hydrogen sensor would be used to get more accurate results. 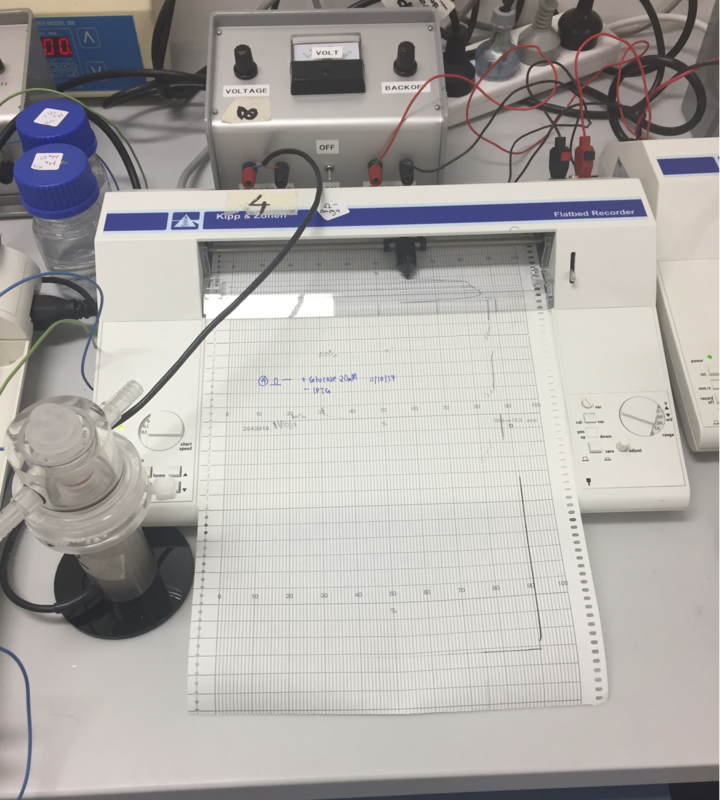 We extracted the gas from the gas measuring apparatus from the negative control, the DH5α culture, and the induced HGPGC culture. When the negative control's gas was injected into a test tube and ignited with a match, no sound was produced. But, when the induced HGPGC's culture's gas was injected into a test tube and ignited with a match, a POP sounded! This indicated that more hydrogen gas was present in the induced HGPGC's culture than in the negative control, which coincides with both the Clark electrode and gas measuring apparatus results. 1. D. Mišlov, M. Cifrek, I. Krois and H. Džapo (2015). Measurement of dissolved hydrogen concentration with Clark electrode. IEEE Sensors Applications Symposium, pp. 1-5.